Decastro, “who people used to say reminded them of a swarthy Tom Cruise,” had an intense affair with Tuki, who is half Vietnamese and half African American, and was born with male genitalia—but that’s another story. Their love affair ended badly due mainly to Tuki’s refusal to turn over a an “11-million-dollar” ruby to a viciously sociopathic Vietnamese drug kingpin named Wen-Ling, also known as the Dragon Lady. 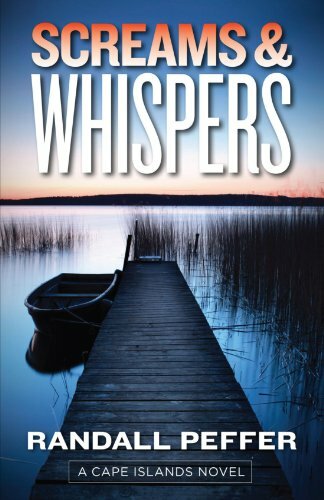 These characters wended their way through murder and mayhem in previous Cape Islands novels, and they do so again—in spades—in Screams & Whispers. This time, the screaming and whispering also involves Michael Decastro’s father, a recently widowed Vietnam veteran, a “wiry fisherman,” who drops everything in Cape Island to head to Southeast Asia with his desperate son to try to rescue Tuki from the clutches of the devilish Dragon Lady. Author Peffer tells the story in chapters that alternatingly focus on Tuki’s and Michael’s misadventures. He fills them with rapid-fire dialogue, flashbacks to their previous melodramatic escapades, and plenty of Stieg Larssen-like bold plot twists. Fortuitously, the senior Decastro speaks Vietnamese, so the Massachusetts men’s quest involves much interaction with the locals. Miraculously, said interaction includes the emotional reunion the elder Decastro has with his former wartime lover who winds up aiding them in their rescue mission. Along the way, much evil is perpetrated by the Dragon Lady and her minions, including murder, torture, and child abuse. So this tale is not for the squeamish. There is a spot of redemption in the end, but lives are lost and lives are damaged along the way. And they are lost and damaged in ways that too often are difficult to stomach. Marc Leepson is a journalist, historian, and the author of seven books, most recently Lafayette: Lessons in Leadership from the Idealist General (Palgrave/Macmillan, 2011). He served with the U.S. Army in Vietnam and is senior writer, arts editor, and columnist for The VVA Veteran, the magazine published by Vietnam Veterans of America. He also teaches U.S. history at Lord Fairfax Community College in Warrenton, Virginia.